"My wife and I highly recommend using Melissa as your real estate professional. She helped guide us every step of the way empowering us with all the information we needed to make the best decisions. Melissa helped us buy our new home and sell our current home. Buying our new home was not an easy endeavor. We were a backup offer at first, but Melissa's guidance helped us secure the home. Our current home sold in less than 24 hours for full asking price! We couldn't be happier with how the entire process worked out from start to finish." Melissa is a 5 star agent. I would use her again in a heart beat. She offers a stager at no additional cost which was a big plus, was very much in contact throughtout the process of selling and closing. We are hoping to see a small rental property with her help and we have been recommending her highly to friends and family. Melissa is a polished professional who is familiar with the area. She prepares for client meetings and provides solid recommendations and feedback. Her follow-up is excellent and she establishes expectations for the selling process up front. I just closed on my house and Melissa has made it actually pleasurable. It nearly went off without a hitch but even in light of a “complication”, she coordinated the entire team to pull off a last minute miracle. I would highly recommend Melissa!! Also want to give a shout out to the photographer she works with. He took AMAZING pics! Exceptional professional service and market knowledge. Follow up was always within 30 minutes at any time, even when she was enjoying a trip for her anniversary. We were moving to the area from out of state, therefore, we could not be in Greenville at a moments notice, which was critical with the market. Melissa was creative in using technology to keep us abreast of what was happening with our home. She respected our needs and wishes and was exceptionally responsive at bringing our builder and myself together, and simply getting the job done to find us the perfect home. Melissa's knowledge and expertise are undeniable. I would definitely recommend her to all my family and friends who are looking for an excellent realtor! Melissa is truly available 24/7 and will address all of your questions and needs immediately. We sold our current home and bought a house on the same day and Melissa navigated us through all of the ups and downs without missing anything. Our house sold in 48 hours for full ask and we utilized numerous contacts and resources that Melissa recommended (contractor, closing attorney and loan officer) who were excellent at their jobs and very professional. Melissa is just as wonderful as everyone says. She knows what she’s doing and isn’t afraid to go the extra mile when getting comps, etc for sale of home. We are grateful for her experience and professionalism. Thank you, Melissa! Being #1 does not equal an arrogant realtor who’s impersonal. She’s kind, helpful and well-versed in her field. Great experience! Highly recommend Melissa!!! She offered us advise on how to sell quick, we followed her advise and viola....house sold in 3 days. She has great contacts if you need new carpet, granite etc and knows what appeals to buyers. Very easy person to work with. Melissa was amazing to work with! She is prompt, on top of everything, and pays attention to detail. She knows how to sell a house. I loved her full service offerings (i.e., stager, professional photographer, etc.) and I think these extra steps really set her houses apart from others on the market. I would definitely work with her again and will recommend her to anyone I know selling/buying a home. Melissa is very knowledgeable about the market our home was in. She was prompt every step of the way in her responses to our questions. I guess the best testimonial is that I would contract her again if I had a house to sell in this area of Greenville. Melissa is one of a kind! She is kind & considerate mixed with professional & motivated...a perfect combination for a realtor! I loved every minute of working with Melissa. She answered our calls/texts/emails immediately, she took care of issues promptly & she was always a step ahead. We found our house fast, but hit some bumps along the way, and Melissa was exactly who we needed on our side. We couldn’t have done it without her! I highly recommend Melissa & have already passed her contact information to my friends! Melissa was so awesome!! She was the most on the ball realtor we have ever worked with. We ran into a few snags along the way and she helped us through it in an awesome way. As we learned, a realtor's value comes in the ability to get you from the signed contract stage to the closing table, and Melissa was so incredible at helping us in this process. I would 100% recommend her. Melissa was awesome! Super Knowledgeable, extremely responsive, amazingly persistent and extra positive! My wife and I could not have asked for a better experience and at the end of the day, we got the house we wanted! We could not have done it it without Melissa. My husband and I were extremely impressed with Melissa’s expertise, professionalism, and tenacious energy. Most importantly, Melissa understood our overall objectives and helped execute OUR approach to the negotiation. Melissa collaborated with the sellers agent effectively, driving a mutually beneficial outcome. Throughout the initial stages and final stages, Melissa was responsive and effective. We could not have asked for a better experience and we could not have done it without her! Melissa was phenomenal! She found us exactly what we were looking for in our new home. We relocated from out of state and didn't know the area at all. Melissa made the process so easy and took so much stress off our shoulders! Uprooting your family to a place you don't know is very scary, but with Melissa we just knew she was only showing us the best options for our family. She mad sure we were in the best school district and best neighborhood to accommodate a young family like ours. We cannot thank Melissa enough for all her kindness, hard work and dedication to our family. My review will sound very much like a lot of other reviews listed here and that is because Melissa is consistent in her approach, reliable to a fault, and as great of an agent as everyone writes of her. She did an amazing job helping us both sell our home and buy a new home. When we listed our home, it went under contract the first day for more than asking price— something I have heard over and over again that she is known for making happen. She did not disappoint! There were many twists and turns in the sale of our home with the buyer and throughout it all, she stayed on top of it all, managing most of the stress and burden of the issues that were impeding the closing. I can not recommend Melissa enough. She is truly an amazing person, agent, and woman. From the moment we met Melissa, we knew we wanted her to both sell our home and help buy our next! She was on time, extremely organized, came more prepared than any other realtor you will meet (with comps, a plan for the sale (including a stager, photographer, etc), contacts for anything we needed, and we had complete confidence and trust in her. That was just the FIRST meeting! Each subsequent meeting only compounded that trust. I have already suggested her to several other folks I work with and will continue to do so. Her communication is shockingly fast and thorough, giving us the impression that she works 24 hours a day answering questions, making phone calls and sending emails. She had the right resources (various inspectors) and a wealth of knowledge and experience we tapped into. Excellent experience, would call on Melissa again with zero hesitation. I loved working with Melissa from the start! She has a bubbly personality that helps calm some of the stress involved with buying or selling a house. She also has a can do attitude and works extremely hard and cares about her clients. We worked with her to buy and sell and were very happy with both. Thanks again Melissa! Melissa was always prompt, knowledgeable and represented us as buyers with keen interest. She was present at all important meetings and continued to stay involved with us during the construction and closing process. There was one thing we weren't happy with when our home was completed but she pressed hard for a resolution so we were happy. Melissa is an incredible agent, from top to bottom. She is an even better person. She was very in tune with what my wife and I were looking for in the sale of our house and in the purchase of our new home. She is incredibly responsive, day or night and really burdened most of the stress during a very stress filled process. Her network of professionals is in incredible and her follow through is second to none. We have used her for 3 property negotiations and all have been a pleasure, thanks to her. Her work ethic is dynamic and I look forward to working with her in the future. I would recommend her to everyone. Melissa stepped into selling our home after it had been on the market for six months with no offers. After a change of agents, we had two offers within nine days of listing with Melissa. We can't begin to express how impressed we are with Melissa and her competent and professional way of doing business! Every text, email, and phone call was immediately addressed, and we always felt we were her #1 priority. From listing to closing, Melissa was simply the best, and we recommend her to any sellers who want quick and happy results! Let her tell you how to sell your home. It sure worked for us! I was moving across the country as was so pleased to be able to lean on Melissa. She was referred by a friend, and I'm so glad she was. Her knowledge of the area and the market, her professionalism and her sense of humor made the process both stress-free and fun. I'm grateful we were connected and would gladly recommend her to anyone. Melissa's the BEST! Melissa was fantastic! She helped us in finding a new home and selling our current home. She was very responsive to any questions we had, and was highly knowledgeable of the area market and the entire buying/selling process. She also connected us to quality contractors for inspection repairs and renovations at the new home. I would very much recommend her to anyone buying or selling. Melissa is a fabulous agent and person! I highly recommend her to anyone who is looking to buy or sell a home. We had an amazing experience with her. She was always prompt, easy to work with, knowledgeable, and professional. Melissa made a stressful process very enjoyable. Helped us find a very nice all brick house in Simpsonville,SC. Prompt meetings with pre-selected properties in our price range. We had less than 48 hrs. to make a purchase. Has been of great help in help after the sale with getting our son settled in since we live in PA.
Melissa did a terrific job in appropriately pricing our home and preparing comprehensive marketing/sales material. Her photographer did a wonderful job capturing the true essence of our home. It's no wonder she is the #1 Realtor in Greenville!!! We recommend her unconditionally! We just purchased our third home with Melissa's help. She has sold one home and is currently selling a second home for us. She is always on time and she answered all of our questions. Whenever we have seen Melissa we have always been treated like a close friend. To say that Melissa was an exceptional agent is an understatement. We were forced to sell our dream home from 2 states away, and needed someone who could take the reigns and get it done quickly. She did just that, and kept us informed every step of the way. We were honored to have her as our agent! I would recommended her to anyone wanting to buy or sell their home. She will get it done!!! Thank you, Melissa!! We learned the hard way that not all realtors provide the same service. Our first realtor did nothing to market our home for 5 months. After 5 days with Melissa, we had a contract and have since successfully closed. Melissa is professional, efficient, organized and very well connected. Don't be fooled by realtors with big promises, go with a proven track record. Don't make the costly mistake we did. Start out with Melissa and you will be extremely grateful you did! Melissa is extremely professional, organized, informed, and helpful. We had an offer five days after our house was listed! She assisted us at every step of the way to closing and was a forceful advocate on our behalf. If you (the reader of this review) need a realtor, don't waste your time on anyone else. CALL MELISSA!! Melissa is truly terrific at what she does! With neither of us living in town, she helped us navigate through the complicated process of new construction, staying on top of any and all issues that arose during the build process. I am sure she has a multitude of clients, yet she always made us feel like we were her only one. She is truly 24/7 making herself available to respond to emails and texts almost immediately. I was never left waiting or wondering. She is so fast, organized, and efficient - I don't know how she does it! Not only that, but she is down to earth and a pleasure to be around. We cannot thank her enough for all her help and support! Top notch! Look no further - Melissa is awesome, professional and made our home buying experience seamless. Thank you for helping us find our first home! Thank you Melissa Morrell for helping us to sell our house!!! Best Real Estate Agent ever! Very professional - always available by phone - text or in person no matter what time or day - lot of positive energy and she just gets it done!!! Due to overseas move she even took care and checked on the house while we were gone until closing. Just a pleasure to work with. We will definitely ask her again to sell a house for us!! Real gem here folks!!! My first meeting with Melissa was on a Sunday evening at the property she sold for me. I was just kind of getting a feel for realtors to see who I wanted to work with. I knew by the time we walked down the hallway of the house she was my girl. She was very prepared and extremely knowledgeable. Melissa guided me through the entire process. I listened to her recommendations and did what she told me to in order to prepare the house for sale. Oh I forgot to mention I live in Pennsylvania. She worked the landscaper, the painters the cleaners all for me. The folks she suggested to do the work I could not have been happier with. She is a little ball of energy. Melissa herself works directly with you. I felt as if I was her only client, she was that committed to selling my property. It doesn't get any better than that. If you are looking for that get er' done attitude and a true professional Melissa is your realtor!! I can't thank her enough for all her help!! Melissa did a fabulous job helping us sell our house! She works hard and is a real go-getter! We will definitely use her again and recommend her to all of our friends! Melissa was amazing! She made the whole processes of selling our home and buying our new home so easy. She always made herself available! I would recommend her to anyone looking to buy or sell! Melissa was a breath of fresh air to work with. I was in Greenville the first week in January to clean up house after renter moved out. I contacted her 2 days before I left to go back to Pennsylvania. She met me with in 24 hrs. and we started the process immediately. I wanted to find a contractor to replace carpet with hard wood floors and she arranged everything from 500 miles away. We had the house ready for the market in a couple weeks and it looked incredible. The house went on the market at 9:00 am on a Saturday and we had 6 showings that day, within 5 hours, the second family to see the house made an offer at full market value. We had 4 more showings on Sunday, but I accepted the offer on Saturday evening resulting in having an offer in 5 hours and acceptance in 11 hours. I would recommend Melissa to any of my friends and colleagues in the Greenville area. She was prompt and got back to me immediately with any questions or concerns. Great working with you Melissa! We truly feel like Melissa is part of our family ...We treasure our 10 year relationship and know that she brings a part of herself to everyone she meets. Whenever I see another of Melissa's accomplishments at C. Dan Joyner, I always post with #RockStarRealtor! Because that is, without a doubt, who she is! Melissa has been a valued member of our real-estate life since 2007. She helped us with our personal home in 2008 as well as three investment properties in 2011, 2012, and 2013. As well she found my mother's home, for her move from South Florida to Simpsonville in 2009, and my uncle in 2015. 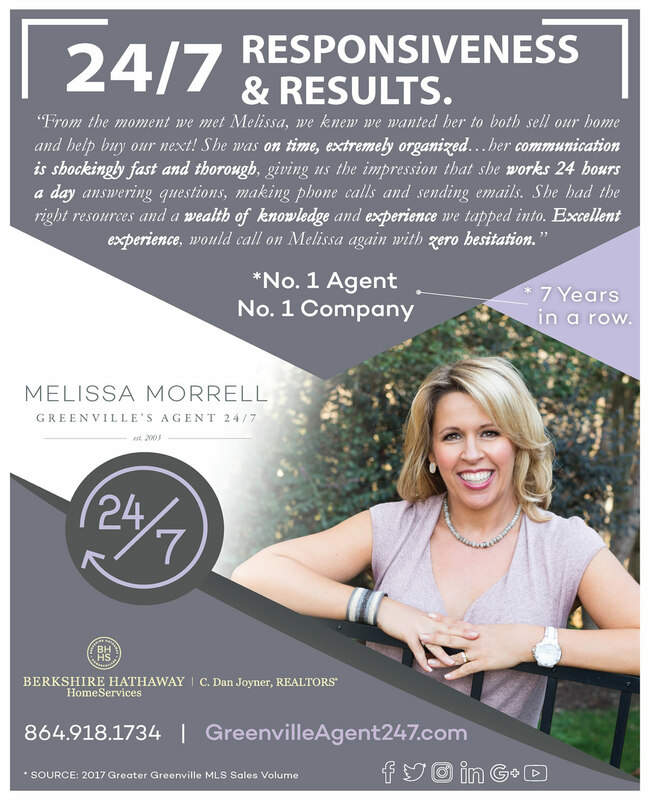 Melissa Morrell is the total package for her real estate clients! She has "their" best interest at heart in every turn they make. She has always gone above and beyond the norm of what is expected in her business. I am not surprised Melissa has achieved this goal working with her for the past 9 years she has always shown dedication, drive, honesty, integrity, and sweat and tears whether it is for her sellers or buyers. She is a dedicated wife, Mother and friend and I am so proud of her and to call her not only my co-worker but also a great friend! Congratulations Melissa! Just saw the ad showing you winning the great honor of being the #1 realtor for 2016! Many congratulations to you! All the best for continued success in 2017! This is a very well deserved milestone for Melissa! She made a very difficult and challenging situation for Tracy and me much easier through her hard work. She is the total package when it comes to real estate in the upstate. You want her on your side. Congratulations! You have worked hard for this honor! Congratulations, Melissa! What a fantastic honor, and it couldn’t have been bestowed on anyone more deserving than you. You possess a level of dedication, humility, and passion that few entrepreneurs can claim, and those qualities have helped catapult you. You also have the strong support of a beautiful family and copious amounts of fans who live and thrive in the homes you helped them find. We love working with you, and look forward to seeing your business and you grow and provide value to all those with whom you come into contact! Melissa- as a friend and my realtor on several occasions we’ve had the pleasure of getting to know your sweet spirit. You are always full of life, determined, dedicated and just an all-around fantastic person. I’m not at all surprised that you have reached this milestone in your career. Congratulations, I have no doubt this is just the beginning of many more. Congratulations Melissa! Your relentless pursuit of excellence for your clients has paid off in many ways, and now you are #1! Very proud of you! Melissa is available 24/7. She responds with amazing speed to all emails, voicemails, and queries. She has sold two properties for me and assisted in the purchase of 2 more. She made a very stressful process easy and I would never use any one else. There is no question as the why she is being recognized as Greenville’s Number One Realtor- she is truly one of a kind! I could not be more proud of, or happy for Melissa. She has been an outstanding example of representing her clients with the utmost integrity and this honor does not surprise me one bit. To be the number 1 individual REALTOR in Greenville is an unbelievable accomplishment and we are so honored for her to be associated with BHHS C. Dan Joyner REALTORS. She is not only an asset to our company, but also to our community. We are so proud of you, Melissa! The Reynolds family moved to Greenville from the D.C. Area where we rented our first home so we could get the lay of the land. After a couple of months of living in Greenville, we were introduced to Melissa. She was extremely eager to help work with us and willing to take the time to truly understand our needs. Melissa found us a wonderful home in an absolutely awesome neighborhood. We couldn't think of a better realtor in Greenville and wouldn't hesitate to recommend her to anyone. PS...her daughter is now our babysitter! Melissa Morrell is an excellent real estate agent with the upmost integrity, service, and work ethic. She really listens to her clients needs and provides them with her exceptional knowledge and expertise. We have bought and sold several properties across the country. When we decided to acquire our last home, in Greenville South Carolina, we were very fortunate to be introduced to Melissa. We had a specific idea of the type of property we were looking for and she found it. We did a tear down, design and build on a seven acre lot in the Huntington neighborhood. She was with us every step of the way- property search, property selection, contract, closing, select builder, and monitor progress of the new house. We were extremely impressed with her dedication to us; no one could have done better! We have the greatest respect for Melissa and recommend her to all our family and friends. Upon hearing of Melissa's recognition as number one realtor in Greenville, we were NOT surprised. We knew we were lucky to have her listing our first home from the moment we met her! It was only weeks after having our first child and we would be moving 1,000 miles away. Melissa is so warm, attentive, professional, and genuine. She took us through a very stressful process and made us feel at ease. Two years later we were fortunate enough to be transferred back to Greenville. There was only one person we wanted to help us find our next home. Melissa worked with us on a very tight timeline. She found us the perfect home for our now family of four. We will always recommend Melissa to our friends and family. And anyone else who will listen! Congratulations on another great year! Good luck in 2017. Congratulations Melissa! You truly are the best realtor we have ever worked with and deserve such a great achievement. Your passion, dedication, and personality are everything to your success. You continue to challenge yourself and it shows. So happy for you and so thankful for all that you have done for our family! Not only have we gotten to witness your professional success these last 5 years, we have also created a long lasting friendship that we truly value. We wish you all the best in 2017! A non-stop fountain of energy Melissa loves what she does and all her clients realize that too! Her loyal army of past clients who refer her their friends and family have helped her grow her business in recent levels to really admirable, Big-CIty-Competitive levels! Even after 5 years of being the number one individual agent within our large firm, she has reached another huge milestone of being the number one REALTOR in our MLS for 2016....I could not be more excited for and proud of Melissa Morrell!